After more than two years of delays, design revisions and drama, the Seattle Department of Transportation (SDOT) began construction on its newest protected bike lane last week. 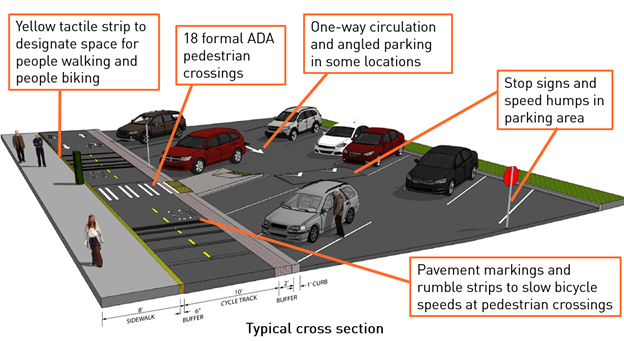 The $3.6 million infrastructure (which SDOT labels as a cycle track) will run along a mile-long section of Westlake Avenue on the west side of Lake Union and will be a vast safety improvement over current conditions. As it stands, biking down Westlake is awful. Bicyclists can choose between riding on a wide, busy road or through a wide, busy, mile-long parking lot that serves the businesses and houseboats along the lake. Unsurprisingly, cars pulling into and out of parking spots, bikes riding in the center of the lot, and pedestrians walking to businesses or jogging through do not mix well. But as the route is one of the flattest, most direct paths from northern neighborhoods to downtown, many riders are willing to take the risk. Finally in 2013, after years of requests by Seattle bicyclists, SDOT announced plans to build a separated bike lane on Westlake as part of the city’s bicycle master plan update. Shortly after, a group of business owners and residents, angry over the possibility of losing some of their nearly 1,300 publicly owned parking spots, filed a lawsuit to block the entire master plan. The group later dropped the lawsuit on the condition that SDOT create a community design process to allow granular review of the project. SDOT Community Engagement Liaison Dawn Schellenberg says they held 11 meetings over the course of a year. Much of the energy was focused on parking studies and in the end, SDOT and the Westlake stakeholders agreed to a compromise design that preserved 90 percent of the parking. Then, just when it seemed like all the barriers had been cleared, a Westlake “superyacht” moorage site and dealer called Nautical Landing sued anyway. Nautical Landing’s complaint stated the city had not done sufficient environmental review under the State Environmental Policy Act. Mayor Ed Murray intervened to keep the suit out of court and brokered a deal where Nautical Landing keeps several parking spots in front of its office. The compromise is that the bikeway narrows from 10 feet to 8 feet for that short section. With that, Schellenberg says SDOT is confident the project is finally in the clear. The city expects the route to open in summer 2016. It’s no surprise that business owners dug in their heels to fight against the loss of parking spaces. But it is a little surprising that it took such a tremendous political lift to get a mile of safe bike infrastructure installed on one of the most popular bike commuter routes in the city. Seattle has a bike-friendly city council and DOT and a mayor who has publicly voiced support for cycle tracks. Last November, voters approved “Move Seattle,” a $930 million transportation levy, a large part of which is dedicated to bikes and walking. That is true. But the Westlake experience is likely a preview of the major fights ahead for Seattle streets advocates as they push for a complete network of protected bike lanes downtown and beyond. The high-quality bike infrastructure Seattle needs will have to come at the expense of some parking. The Westlake fight makes it clear that infrastructure will be hard won every step of the way.